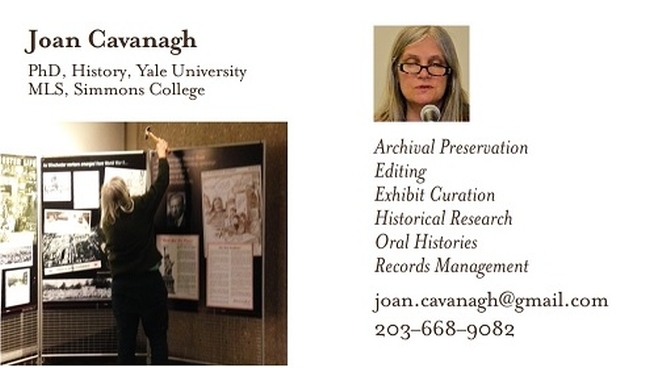 Next Planning Meeting date is Mon., Jan. 5, at 8 p.m….all welcome…call (203) 562-2798 for location. Let us know what your group is doing! Write an article for February’s PAR newsletter. New Haven students and community members are building a renewed movement against police brutality and terror. In response to the non-indictments of the officers who killed Darren Wilson in Ferguson, MO and Eric Garner in Staten Island, NY, hundreds of people have demonstrated in the city to loudly proclaim that they have had enough of police terror and an injustice system that lets killer cops walk free. On Dec. 5, despite rain, 400 took over the streets of downtown. On Chapel Street a 7-minute moment of silence was held for Eric Garner, the amount of time he was left handcuffed and dead on the sidewalk. The march also shut down the intersection of Church and Chapel for nearly 30 minutes, demonstrating that there cannot be business as usual while police get away with these killings. Yale students also held a die-in on Dec. 5, where hundreds lay down on the sidewalk. The movement against police brutality requires being on the street and organizing in our communities. Eighty people attended a community meeting on Dec. 14 to strategize how to build the fight-back movement. At the meeting, called by ANSWER, People Against Police Brutality, MALIK, Black Student Alliance at Yale (BSAY) and more, tactics on how to fight the NHPD’s “surge” were discussed. The surge is New Haven’s version of “stop and frisk,” targeting anyone deemed undesirable by the police for random searches and questioning. The meeting also addressed legislative and community efforts needed to win justice. 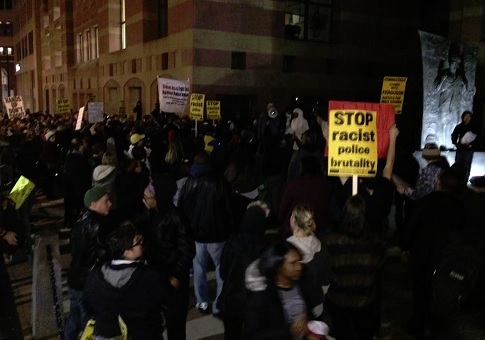 A new movement is being formed across the country and New Haven will be an important center of organizing and building solidarity against police brutality! For decades the Interreligious Foundation for Community Organization (IFCO)/Pastors for Peace has been working for an alternative people-to-people foreign policy. PEP has supported the work of IFCO for many years, having given their 1993 Gandhi Peace Award to Reverend Lucius Walker, Jr., founder of IFCO, and recently having had Gail Walker, Director of IFCO, in New Haven deliver a lecture on “Why the World Needs Cuba.” Embracing this long overdue victory we will continue our support and work to end the Cuban blockade once and for all. Today, we join the Cuban people in celebrating a successful step toward new diplomatic relations between the US and Cuba! While this is a step toward what we’ve been working for, there’s still much to be worked out and analyzed. We know that the right-wing won’t go down without a fight. Our Work Continues! Email your senators and members of Congress! Let them know you support normalization of relations and a repeal of the Helms-Burton and Torricelli legislation against Cuba. My name is Elaine M. Kolb, member of Not Dead Yet and Second Thoughts Connecticut, and I am testifying against the assisted suicide bill, S382. Thirty-eight years ago, I was stabbed in the back, resulting in a spinal cord injury. Now, at 65, I am also officially old. Sixteen years ago, at this time, my partner for eleven years, Patti Deak, was in the hospital. Weakened by chronic bronchitis, asthma, scoliosis, and a life-long neuro-muscular disease, she developed pneumonia and both of her lungs collapsed. Growing up with a disability, which relentlessly became more profound, Patti was told that she should expect to die young. She endured the insults and injuries of a culture which did not recognize her as a full citizen. Her whole life was a struggle for needed equipment, treatments and services. Remember, it was not until 1975, with the passage of the Education for All Handicapped Children’s Act, that public schools were required to even begin to attempt to include and teach children with disabilities. Prejudice against people with disabilities of all ages continues to be extreme, sometimes deadly. Among those of us with long-term, visible disabilities, we share some terrifyingly common horror stories. Family, friends, even perfect strangers will say something like, “Oh, I could NEVER be as strong and brave as you are. If that happened to ME, I’d rather be dead.” Not a compliment. We experience insults, along with every kind of injury. Patti Deak loved her life and our life together. So, when both lungs collapsed in December 1998, she decided that she was willing to go on a ventilator. Then we had to fight to get to pulmonary rehab at Gaylord Hospital, so she could come home. Sadly, she had further complications and went on hospice care. She died on March 10, 1999. She was forty. Patti Deak lived and died with dignity, with multiple disabilities, using a power wheelchair, hospital bed, Hoyer lift, hearing aids, and a ventilator. When some non-disabled folks talk about “death with dignity,” they actually mean “death before disability” or “death before Depends.” With cut-backs in so many essential services, the message behind assisted suicide is that death is cost-effective. For those of us in danger of being denied what we need to live, “Compassion and Choice” feels more like “Contempt and Coercion.” We want to live with dignity and the recognition that our lives are beautiful and valuable and meaningful, just as we are. Extend palliative care, hospice services, and end-of-life counseling. PLEASE do NOT pass assisted suicide in any form, including S382. 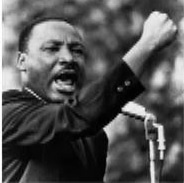 We need to fill volunteer spots for the Yale Peabody Museum’s 19th Annual Celebration of Dr. Martin Luther King Jr.’s Legacy of Social and Environmental Justice event on Sunday, Jan. 18 (noon to 4 p.m.) and Monday, Jan. 19 (10 a.m. to 4 p.m.). We also could use people to help us set up on Saturday, Jan. 17. If it’s easier for you, feel free to leave a message telling me “Sunday or Monday” and “morning or afternoon or even all day” and I will find a spot for you. Please let me know as soon as possible where you can help out. We really do need ‘all hands on deck’ for this extensive two-day event – one of the biggest of the year for the museum. So let me know what you would like to help with! Remember, we are happy to have you to work full days or on Sunday and/or Monday or to set up on Saturday. Have a wonderful holiday and we look forward to hearing from you and definitely seeing you in January! With best wishes for 2015, Elisabeth, (203) 432-3731, peabody.volunteers@yale.edu. Since 2006 there has been an active group in the New Haven area working towards building CT’s first cohousing neighborhood. The group known as Green Haven finally won zoning approval in the town of Bethany last June for their project and officially bought the 33-acre former dairy farm in September. The neighborhood will be called Rocky Corner after the historical name for that section of Bethany. This corner was where the original town schoolhouse was built and where the c.1750 farmhouse still remains. Rocky Corner will consist of 30 individual homes. 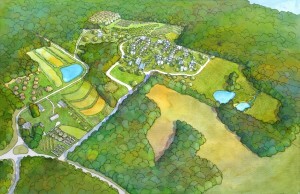 Residents will share the land and a common house where community activities will take place. In this common house, meals will be cooked together and shared. An arts and crafts room will allow residents to create together. A full woodworking shop will be available to all. All rooms will be multi-functional so that the dining room can become a dancehall or theater, a lounge can be a yoga studio, a conference room can be a private music room. All buildings will be extremely energy efficient with thick insulated walls, passive solar heat gain from the south facing windows, mini-split heat pumps as back up for heating and for cooling. The property will be used for the community’s own growing of food; annual vegetables, orchards, berry bushes, edible yards. Sections of the property may be leased to residents who want to do organic farming. 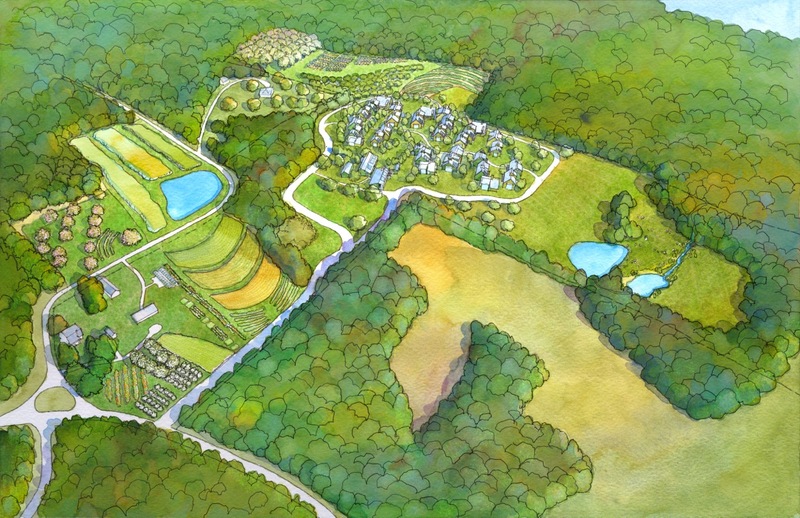 Planned as a multi-generational and multi-economic neighborhood, people of all ages and financial backgrounds are welcome to meet us, see the land and decide if living in an intentional community is for them. Multi-generations will help the community thrive. Children will be safe to run and play in the pedestrian center. Adults will be respected for their knowledge and the skills they can teach to others. We are applying for affordable status for 9 of the 30 homes so hopefully these homes will be subsidized by the state. If you are interested in learning more, contact Marie Pulito (203)393-1245, www.rockycorner.org. Our Vision: Rocky Corner is a vibrant cohousing neighborhood. We nourish respectful relationships among our members as well as with the natural environment and the wider community. The New Haven Healthy City/Healthy Climate Challenge launched an eight week SWITCH! Campaign to have hundreds of New Haven residents switch to clean (wind, solar, etc) electricity in their homes. Between Dec. 1 and Jan. 19 (MLK Day) the campaign will – with your help – result in a reduction of thousands of tons of green-house gas pollution in the coming years. Immediately cut greenhouse gas and other pollution by 3-5 tons per year per person. 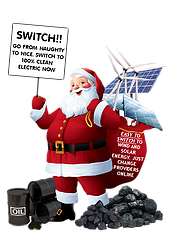 Send a message to the power industry that they need to move away from dirty fossil fuels to meet growing demand for clean healthy energy. Let the State government know that future investment in fossil fuel infrastructure is going the wrong way. The SWITCH! Campaign is using public art, posters, PSAs (on WXPN), and tabling to get out the message that it’s very easy to switch. Please join us and spread the word, get your organization to promote SWITCH! too! The directions are at healthyclimatechallenge.org, or contact Chris at nh@newhavenleon.org for more information or materials. My family and I are back home after some surprising developments at the sentencing hearing in the Syracuse court. I’m writing this by way of update for those who have expressed their care and concern for us but may not have heard the outcome or any of the details. Some links are posted below which provide a good explanation of the action for which I was brought to trial. Most of all, though, I want to express my heartfelt gratitude to all of you who have been walking with us in so many beautiful ways during this time. We could not possibly have felt more loved and supported, so thank you all. After the People’s Climate March: What’s Next for Connecticut Activists? Sunday, January 18, 2015, at 2 pm there will be a panel followed by a discussion period. We want to hear from YOU! Rescheduled from December! 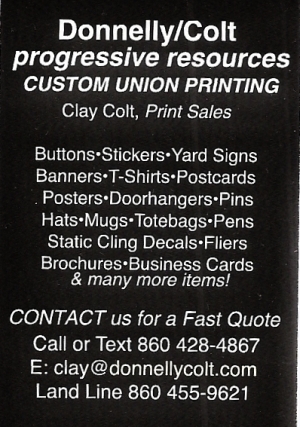 For more info: Chris, (860) 478-5300. New Haven’s Mark Colville Sentenced for Protesting at Drone Base Near Syracuse, NY | Democracy Now! A longtime peace activist was sentenced today to one year conditional discharge for demonstrating outside the gates of New York’s Hancock Field Air National Guard Base, which is used to remotely pilot U.S. drone attacks. 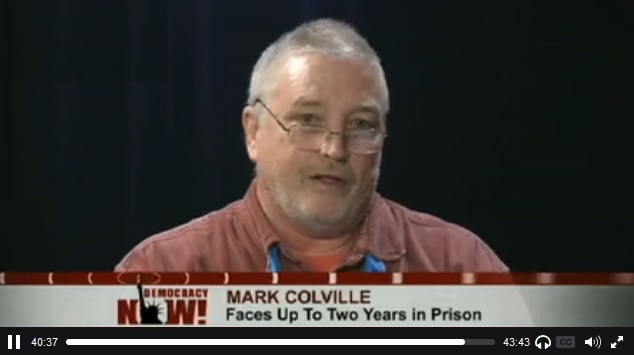 Mark Colville faced up to two years in jail stemming from his arrest last December. More than 100 people have been arrested over the past five years as part of nonviolent campaign organized by the Upstate Drone Coalition. Hours before he learns his fate, Colville joins us to discuss his activism and why he opposes the U.S. drone war. 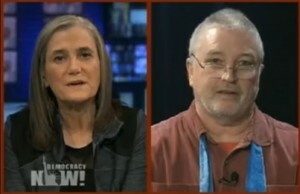 via Peace Activist Sentenced for Protesting at Drone Base Near Syracuse, NY | Democracy Now!. On Sept. 18, 2014, Mark Colville, of Amistad Catholic Worker in New Haven, was convicted on five criminal charges for walking peacefully to the front gate of the 174th Attack Wing at Hancock Airfield in Syracuse, N.Y., along with Yale Divinity School students Creighton Chandler and Greg Williams, to deliver a People’s Order of Protection for the Children of Afghanistan. Mark and his family and community are preparing for his sentencing on Dec. 3 in Syracuse, in a court that has gone to extreme lengths to justify the U.S. government’s extrajudicial killing and crimes against humanity perpetrated through weaponized drone strikes. Before the trial, Judge Robert Jokl threatened to give Mark the maximum penalty allowable, which could amount to more than two years in prison. Note: As you who have supported us in the past know, this situation has placed a stress on the life of the Amistad Catholic Worker, and with Mark away it will continue to increase. We need people to think of ways to help us, both financially and by lending a hand to our work of hospitality. Please put some prayerful consideration into this, and join us if you can! For more information, call Frances Goekler-Morneau: (203) 676-2066; (203) 562-6165. This article from Friends of the Amistad Catholic Worker first appeared in PAR-NewHaven.org.